Enjoy the tropical scent of sweet mangos as you pamper your skin with luxuriously lathering Spa Therapy Mango body wash.
Infused with certified organic botanicals of Mango Fruit Extract, Green Tea & Aloe Vera to gently cleanse and detoxify. Fresh, mild scent. Would definitely buy again. Love it, and Iâ€™m super picky with shower gels. Love this body wash! One of the best scents! 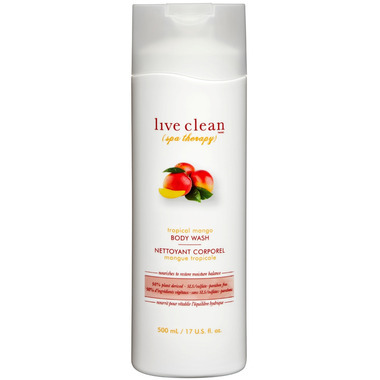 I love the live clean body washes. And this scent is great! Nice mild scent, not too strong, lathers really well. It is clear so when you are sleepy it is hard to see how much you are pouring on the loofah, but you really dont need much, a little goes a long way. I love the smell of this product. It works well and wakes me up in the morning. And well.ca is one of the few places that carry it, so I stock up! I would not purchase this again. I found it left a sticky film on my skin after washing off. I was surprised that it was clear. However, I love the smell. This is my favourite body wash. Its so difficult to find a body wash that isn't creamy. My skin breaks out as soon as it's a creamy moisturizing body wash. This formula is Fantastic! It leaves my skin feeling great, the scent is lovely in the shower but doesn't linger to annoy you and best of all no breakouts!! I can't seem to find this item anywhere except on well.ca yet another reason why this site is my #1 go to for everything. This a very nice, sudsy body wash. The scent is lovely without being overpowering. It doesn't dry my skin. Great to find a body wash without SLS.